I've compiled a list of the "big ideas" that I'm strongly considering adding to Magnatune. They're "big ideas" because they each have the potential to make a significant contribution to Magnatune's growth, rather than smaller ideas which could cause incremental growth. I'd *love* feedback on the things on this list, as well as what people think my priority list should look like The first two are almost done -- the "collections" feature is up as of tonight, you can see it at http://magnatune.com/collections/ as well as in many albums. I have more data entry to do over the next few days, to get the collections to be truly useful, but I think it's there enough to see that it's a nice feature. - 5 free copies for friends when you buy - change the policy that when you buy an album at Magnatune, you are legally allowed to share that album with 5 people. You can rip the CD if you like, or pass the downoad instructions along. However, to make it easy, we'll change the buying form so you can name 5 email addresses of friends who should receive download instructions to this album. People might also want to buy albums just to introduce their friends to Magnatune music. - wiki - web site section on Magnatune where fans can post their own favorites, comments, participate in "street teams", meetings and more, and artists can upload concert info, photos, lyrics &c. Also, if there are related projects, the wiki is a convenient place for those people to organize themselves. I'm looking at Tiki Wiki. - fan-submitted podcasts - people make their own podcasts which have no other music by Magnatune (but talking is OK). We host them, and promote the best of them to our audience. - bulk buying (ie distributorships) - add a "buy in bulk" option when buying, where any one who wants to sell Magnatune CDs can buy them at the super-low price of $6 each (the normal wholesale price of CDs from a distributor is $9). In theory, cafes, art galleries, clothing stores, etc might be interested in selling our CDs. Anyone who wanted to buy 50 copies of a CD would be allowed to do so (no need to limit it to just companies). The downside is the need to print 1000 CDs of any title that is ordered, which initially costs about $2000 (all costs inclusive) as well as paying for warehousing and fulfilment services for the unsold CDs. - gift certificates - buy a credit for a certain number of albums - you pick the price you want to pay for the albums, and the gift certificate would be a number of albums, not a dollar amount. - local meeting groups - the "Cult of Magnatune" meets to have a drink and gossip about how evil the music industry is. These wouldn't be a heavy sales pitch, just a friendly get-together of people who are into the ideals Magnatune stands for. Ideally, when there are events we need some volunteers for (such as handing out Magnatune literature at the door to MacWorld) this could be a way to get people involved. - offer pay radio stations - people have saiid they would pay to listen to our radio stations if they were commercial free. Am thinking of offering all our stations w/o commercials at $10/month. - street teams - many labels help their band's fans promote the bands in their area. In the industry, this is called "street teams". For an example, check out Cell Dweller's street team page: http://celldweller.com/2005/streetteam.html - in theory, regional heads of the street teams could be set up, and the Magnatune wiki and discussion lists could be used to organize things. - quantity buying discount: allow people to buy a 50 or 100 pack of downloadable albums, purchased all at once, discounted steeply (ie, $50 for 30 albums, $70 for 50 album, $100 for 100 albums, maybe $150 for everything on Magnatune). This could be run in two ways: a permanent buying credit, where you can download any albums you want, taking as long as you want to choose the albums, or it could be a "all 40 albums in the rock section for $50". The business rationale is that people rarely spend that much money at Magnatune. The incentive for the buyer is that the per-album price goes way down, cheap enough that it makes sense to fill an iPod with Magnatune music. - discount as you go: 30% discount on another CD if you buy another one today (increasing discount per CD during that day). When you buy one CD, the system offers you a 30% discount if you buy another CD today. Perhaps, the discounts increase as you buy more in one day. But, this may backfire and people may choose not to buy when they want an album, instead saving up several purchases to get the discount. People frequently ask me for a card of some sort to remind them to visit Magnatune. I've also been told by Magnatune fans that they often talk up Magnatune to their acquaintances, and that a card to give to people would be handy. So... 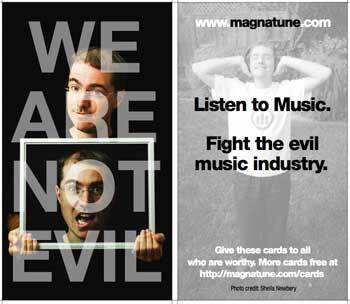 I've decided to print "Magnatune Recruiting Cards" which I'll be sending, free of charge, to anyone who asks. Just send us an email with your postal address (anywhere in the world) indicating you want some cards, and we'll send you an envelope full of them. We'll also be including a few of them with every CD purchased. These are the same size as business cards, so they fit easily in your wallet, and you can carry them everywhere you go (grin)! CNET writes today about Warner Bros announcing that they are launching an online-only label, which will release songs in 3 song chunks, and surprisingly, musicians will keep the copyright to the master recording. The wording of the rights retained seems tightly worded: "artists signed to the e-label will retain copyright and ownership of their master recordings" -- I'm not sure if this means that the artist won't keep the rights to the publishing (ie, the song writing), but as labels frequently don't get publishing rights, I'm assuming this is a "less evil" agreement. My hunch is that Warner is trying to offer a carrot to the super-stars who recently have been recording songs and selling them directly from their web sites, or doing direct deals with iTunes. I'm not sure where the "3 songs at a time" concept came from, it seems odd to me. And my favorite line from the article, is when the Warner CEO says "We like government levies when they benefit us" -- finally, some honesty! Yahoo Japan announced today that because of pressure from iTunes Japan, they're starting a new online music service where buyers can listen to entire tracks before buying them. The service will only have 100,000 songs, so they must have struck some special deal with some labels to allow them to do that. When people ask me why Magnatune "is important" I tell them that it's because eventually the whole online music space will adopt much of what Magnatune does, just as the software industry changed its practice because of shareware & small publishers over the past 20 years. The reason: no DRM, listen-before-buying, full-quality-downloads, and selling a no-evil product are all competitive advantages, and in an efficient market (which we're slowly getting) these competitive advantages win out. So... Yahoo Japan will have "try before you buy" ... I'll be that if the feature does well in Japan, they'll introduce it at the USA version of Yahoo Music.